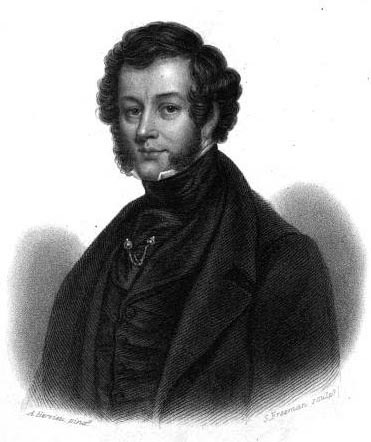 A famed chef and cookbook author appears in the TV series "Victoria" - Francatelli (1805-1876). Born in London, trained in France by Careme, he became "Chief cook and Maitre d'Hotel" from 1840-1842 for Queen Victoria (crowned 1838). After a "fracas" at Buckingham Palace in 1841, he was let go and his first, highly popular, cookbook The Modern Cook was released in 1845. In the new PBS/ITV series Francatelli is portrayed by Ferdinand Kingsley, son of British actor Ben Kingsley. What I have seen thus far he is wooing one of the staff and talked about making the Feb 10, 1840 wedding cake. 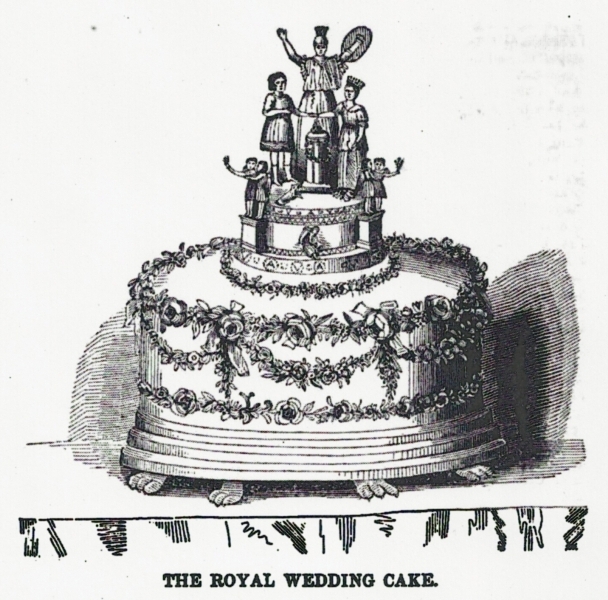 Actually he started working for the Queen a month after the wedding on March 9, 1840 for 250 pounds a year (see Smithe's lengthy bio, link below). I hope the series shows him cooking or the dinner table, AND some of the "broils and ill feeling" among the kitchen staff culminating in his insulting the deputy comptroller, so a policeman was called but our guy "managed to make his escape." On Dec 1 the Lord Steward held an investigation, and he was suspended "until the matter shall be laid before her Majesty and Prince Albert." "The Author hopes he shall be excused for alluding to himself, and his pretensions for writing a book of this kind. Although bearing a foreign name, he is happy in being an Englishman. He received his professional education in Paris, and acquired a knowledge of his art in some of the most celebrated cuisines of that capital, and was so fortunate as to become a pupil of the renowned Carème. [1784-1833] Qualified under such favourable auspices, he has subsequently served—he hopes with satisfaction to his patrons—some of the most distinguished bons vivants among the British aristocracy and gentry. He has had the good fortune to be Chef-decuisine to the Earl of Chesterfield; Lord Kinnaird; and to Sir W. Massey Stanley, Bart. and Rowland Errington, Esq., at Melton Mowbray; and he shall ever consider it the greatest honour to which he could aspire, to have served as Chief Cook, and Maitre d’Hotel, to her Most Gracious Majesty the Queen. LONDON : 21st February, 1846." 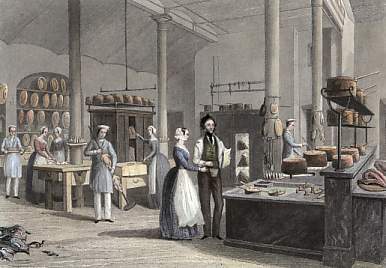 On Tuesday [Dec 1] a long investigation took place at the Board of Green Cloth, before the Lord Steward of the Household, when nearly twenty persons of the royal establishment were examined respecting an affray between Mr. Norton, the deputy comptroller of her Majesty’s household, and Mr. Francatelli, chief cook of the royal kitchen. 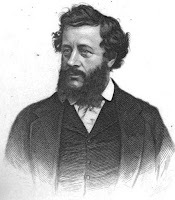 It appears that broils and ill-feeling to a great extent have been for some time existing in the royal establishment: and on Monday Mr. Francatelli took an opportunity of insulting Mr. Norton in the presence of all the pages and about forty others, when high words ensued, which ended in a policeman being sent for to take Mr. Francatelli into custody, but he managed to make his escape before the officer arrived. The result of the investigation has been the suspension of Mr. Francatelli until the matter shall be laid before her Majesty and Prince Albert, when it is thought that measures will be adopted to prevent a recurrence of such proceedings." 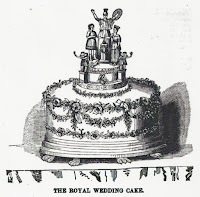 The second possible reason - that the Queen preferred the English cookbook authors food - was proposed by the novelist Catherine Gore (she had just returned from nine years in Paris). Gore wrote in the article "The French Cook" that the French used the title 'chef' while the English used 'cook'. She felt the Queen preferred the English recipes of Glasse or Rundell, and French cooks were only appreciated in British clubs and hotels. After working for 8 years at the famed Reform Club [Alexis Soyer, their first chef from 1837-1850, designed the state of the art kitchen], Francatelli wrote The Cook's Guide and Housekeeper's & Butler's Assistant (1861), and The Royal English and Foreign Confectionery Book (1862). He then worked for the Prince and Princess of Wales for a few years. 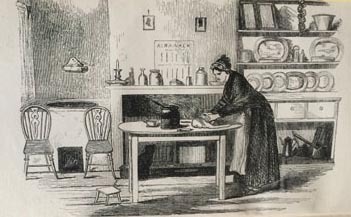 A cooking-stove, with an oven at the side, or placed under the grate, which should be so planned as to admit of the fire being open or closed at will; by this contrivance much heat and fuel are economized; there should also be a boiler at the back of the grate. By this means you would have hot water always ready at hand, the advantage of which is considerable. Such poor men's cooking-stoves exist, on a large scale, in all modern-built lodging-houses. Also, a three-gallon iron pot with a lid to it, a one-gallon saucepan, a two-quart ditto, a frying-pan, a gridiron, and a strong tin baking-dish. "Among the various changes which of late years have affected our time-honoured regulations of the dinner table, none have brought about so complete a revolution in their manner, style, and character as the introduction into this country of serving all, or nearly all, recherchis dinners A La Russe. This fashion, I need hardly say, consists in the excellent practice of having the whole of the dinner carved and served from the sideboards, whereby not only expense and much extravagance are saved, but the comfort of the guests—a matter of no little importance—is enhanced, by doing away with the annoyance arising from the removal of the various dishes over their heads."